In 2005 Martine Loesch after a stroke of fate moved from Ibiza to Morocco. Within 3 days of her arrival, 3 neglected mares and their foals came to live with Martine. How this came to be, well… her two horses Shantira and Nacona were grazing on open land and much to Martine’s surprise they returned home that evening with the mares and foals in tow. They were hungry, thirsty and completely exhausted. With Martine they found water, hay and the love and caring that they desperately needed. Later, Martine came to know that these horses had been abandoned and for many years were suffering from malnourishment and neglect. Gradually more and more abandoned and abused horses found their way to Martine. After taking them under her wing, feeding them and nursing them back to health, these neglected horses slowly began to trust her. Sure enough, once they were in good health, the ‘owners’ of the horses would appear and demand money for them. Of course, paying for the horses was never a straightforward process and would often involve months and sometimes years of fraught negotiation. It was Martines mission to protect these horses and to prevent them from returning of a life of abuse, abandonment or neglect. Over the next 10 years, Martine freed more than 20 horses from an uncertain future. All this she did with the generosity of her time, relentless hard work, her huge caring heart and, of course her life’s savings. At one point there were 40 horses under Martine’s care, including some foals that were born into the herd. In due course, all of the stallions were castrated and no more foals were born. Over the next few years, Martine found caring, private, homes for 19 of the horses. Today, there are 18 horses that remain in the herd and need to be fed and cared for. 4 of the horses are on the Island Mallorca with Mashanti. 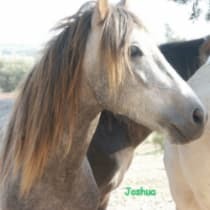 The urgent plan is to bring the remaining 14 horses from Morocco, over to Europe. Some of the horses are happy to be re-homed if they are able to find suitable, loving families to live with and be taken care of. Donor and foodsponsors are invited to Maluhia Mallorca. To spent time with this amazing herd.